Source: Hymns for the Young, 4th ed., London, 1836. Many versifications of Psalm 23 act as hymns of assurance and confessions of trust. We know the text well – “The Lord is my shepherd, I shall not want.” This text, attributed to Dorothy Thrupp, differs from those texts. Rather than an assertion of our faith, it is a prayer that stems from our faith. It goes, if you will, a step further than the psalm’s declaration. We know that God is our Shepherd. We know why we trust. And because we have that trust, we ask that God be faithful. We acknowledge our dependency and our emptiness, and ask that God would provide. We ask not in doubt, but in faith. Every verse of this hymn contains a promise we have from God, and a prayer we make because of that promise. This is how we are called to live our lives as followers of Christ – in prayer, because of faith. Thrupp’s text is a beautiful example of how we might live out that calling. There is some contention as to who wrote this hymn text. Some attribute it to Henry F. Lyte, and others to Dorothy A. Thrupp. Most people lean towards Thrupp, since it appeared in a hymnal she edited, and since she often published hymns anonymously. According to hymnologist Albert Bailey, the text is “largely on the child’s level,” the only theological suggestion found in this hymn being, “Thou has bought us.” The rest, he argues, is a poetic rendering of ideas found in Ps. 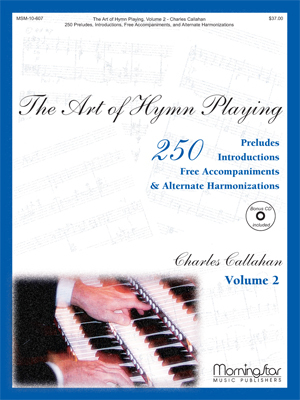 23 (The Gospel in Hymns, 184). And he is entirely correct. 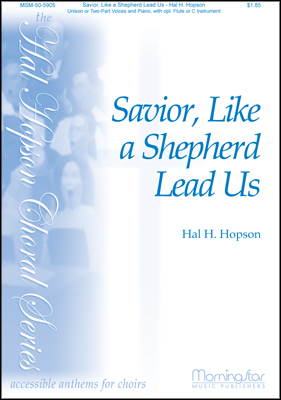 This hymn was originally written for children, so it makes sense that it’s on a “child’s level.” While he might criticize the lack of theological insight, the way Thrupp took a familiar image like the Shepherd in Psalm 23 and spun it to provide us with words of prayer is brilliant. William Bradbury wrote his self-named tune, BRADBURY, expressly for this text, and it is still the most common tune we sing with Thrupp’s text today. It might not be one of the most inspiring tunes ever written, but it is sung with much gusto and love by congregations. Other tune options include RHUDDLAN or PICARDY. Leigh Nash, best known as the lead singer of Sixpence None the Richer, has a recording of the hymn on her album Hymns & Sacred Songs with a fabulous modern folk tune that would be very easily adaptable for congregational singing. This hymn could be sung during any point in the liturgical year, but would be especially fitting in a service themed on trust in God. Examples could be a New Year’s Day service or a baptism service. It would be powerful after the prayer of confession and assurance of pardon, after a reading of Psalm 23, or as a hymn of response after a sermon about trust or Psalm 23. Hascall, Nancy. 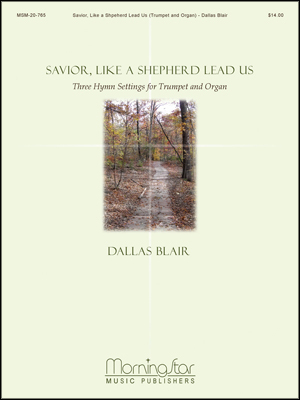 Savior, Shepherd, Jesus - Handbell medley of "Savior, Like a Shepherd Lead Us, and "My Jesus, I Love Thee"
Display Title: Savior, like a Shepherd Lead Us First Line: Savior, like a shepherd lead us Tune Title: BRADBURY Meter: 8.7.8.7.D Scripture: Psalm 23:1-3; Psalm 103:10-12; Proverbs 8:17; Isaiah 40:11; Ezekiel 34:14-15; Ezekiel 34:23; Micah 7:7; John 6:37; John 10:4; John 10:14-16; John 10:27; John 13:1; 1 Corinthians 6:19-20; 1 Corinthians 7:23; Ephesians 2:4-5; Titus 3:5; Hebrews 4:16; Hebrews 13:20-21 Date: 2013 Subject: Christian Year | Baptism of Jesus; Christian Year | Transfiguration; Guidance | ; Jesus Christ | Life; Love of God for Us | ; Redemption | ; Trusting in the Promises of God | Source: Thrupp’s Hymns for the Young, 1836, alt. Display Title: Savior, like a shepherd lead us First Line: Savior, like a shepherd lead us Tune Title: SICILIAN MARINERS Meter: 87. 87. 87 Date: 1985 Source: Hymns for the Young, ca. 1830, alt. Display Title: Savior, Like a Shepherd Lead Us First Line: Savior, like a shepherd lead us Tune Title: BRADBURY Author: Dorothy A. Thrupp, 1779-1847 Scripture: John 10:29; John 10:27 Date: 1982 Subject: Christ's Love | ; Christ the Shepherd | ; Commitment | ; Growth | ; Guidance | ; Protection | ; Trust | Source: From Hymns for the Young, 1836. Display Title: Savior, like a Shepherd Lead Us First Line: Savior, like a shepherd lead us Tune Title: BRADBURY Meter: 87 87 87 Scripture: Psalm 23; John 10:1-16; Ephesians 2:4-5; Romans 5:8 Date: 2006 Subject: Psalm paraphrase | Source: Hymns for the Young, 4th ed., London, 1836, alt. 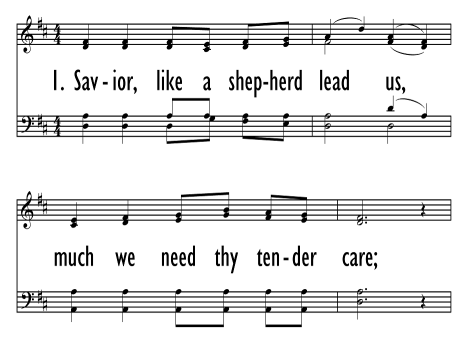 Display Title: Savior, Like a Shepherd Lead Us First Line: Savior, like a shepherd lead us Tune Title: SHEPHERD Meter: 8.7.8.7.4.7. Scripture: Psalm 23; Isaiah 40:11; Ezekiel 34:11-31; John 10:1-18; John 10:27-28; Hebrews 13:20-21 Date: 1995 Subject: Trust and Guidance | ; Assurance | ; Christ--Guidance | ; Christ--Shepherd, the | ; Invitation and Response | ; Trust and Confidence | Source: Dorothy Ann Thrupp's Hymns for the Young (1836), alt. Display Title: Savior, Like a Shepherd Lead Us First Line: Savior, like a shepherd lead us Tune Title: RHUDDLAN Meter: 87 87 87 Scripture: Psalm 23; John 10:14; Luke 10:37; John 10:16 Date: 1987 Subject: Family | ; Shepherd, God/Christ as | ; Home | ; Songs for Children | Hymns Source: D. Thrupp's Hymns for the Young, 1836, alt. Display Title: Savior, like a Shepherd Lead Us First Line: Savior, like a shepherd lead us (Iesu no ke Kahuhipa) Tune Title: BRADBURY Author: Laiana, 1807-1886; Dorothy A. Thrupp, 1779-1847 Meter: 8.7.8.7.D. Scripture: John 10:1-29 Date: 1995 Subject: Easter Season | ; Jesus Christ | Savior; Jesus Christ | Shepherd; Trust | ; Year A | Easter 4; Year B | Easter 4; Year B | Proper 11; Year C | Proper 19 Source: Hymns for the Young, 1836, alt.